The Maxine of Hollywood collection is designed to embrace and enhance women of all shapes. The collection consists of beautiful prints and feminine detailing in swim dresses, sarongs, tankinis, and one-piece suits. 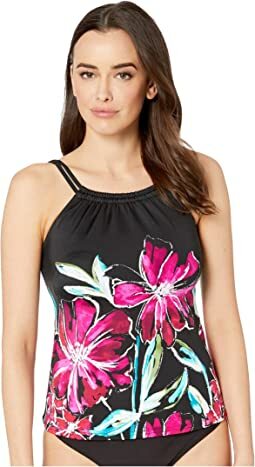 Tummy control panels and inner construction enable women to look great and feel "in control" while wearing a swimsuit. The styling camouflages figure fl­aws, offering added support and shape. This was advertised and later confirmed as a one piece suit. Not so it IS ONLY THE TOP. very disappointed. Love ? these shorts! I have two toddler aged sons & I feel so comfortable playing with them in these shorts in the water! I ordered the wrong size though just placed another order for one size down as this is just DARLING! The print is cute, and I had thought that the flounce/layers might add bulk and make me look even bigger, which is the last thing I want and need, but it didn't. 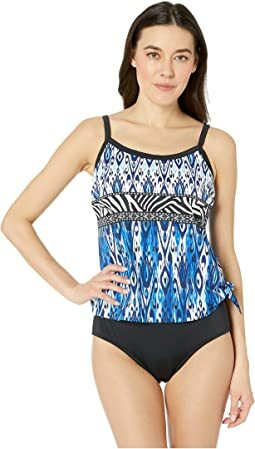 It still shows that you have a shape and if you want to be a tad more modest and wear this with black swim trunks/bottoms or even a swim skirt or have something to lounge in while others are swimming--this could be the ticket. I was not familiar with this brand before, and this top definitely has put them on my radar. I look forward to getting my replacement in the smaller size though it's not because it ran big. I just ordered the wrong size. It fit perfect. The material is soft & dries fast. Love it! A little on the small size. Adjustable straps comfortable built in bra. I love love love this bathing suit. I am, to say the least, a full figured 70 year old and this is the suit for me! Love! I bought this for my Mom. She was so happy with it. It is perfect for a modest, older woman. It's a cute suit, and I'm sorry it's going back. The tummy control is very tight, too tight and I'm only about 5 pounds overweight. It's a short suit, I could have overlooked the waist constriction, but it's putting too much pull on the tops of my shoulders. Sorry to see it go back.